Harry has lately developed a bit of a fixation with the story of the Titanic. He enjoys watching Lego videos on YouTube, and it all started when he came across a video recreating the sinking of the Titanic in Lego. He was amazed when I told him that the Titanic was a real ship, and found him some photographs of the ship at sea and the wreck photographs. 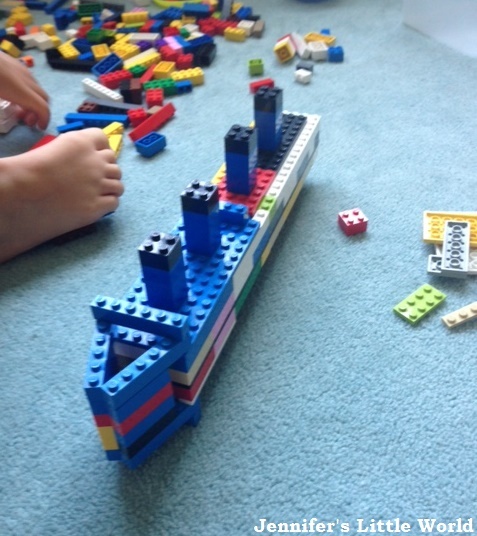 The next day, left alone for a short while with his box of Lego, he managed to craft a rather impressive model of the Titanic and an iceberg to go with it. His model even breaks apart in the middle, just like the real one did. I know that I need to be very careful how we nurture his interest, after all he's only five and he doesn't need to know all the details. But I do think it's really important to try on build on a subject that he has expressed an interest in. After looking through some photographs online my next stop was Twinkl. I'm constantly impressed by their vast selection of teaching resources on such a huge variety of topics, and a search for Titanic materials didn't disappoint. Although some of the resources are only available to Premium members with a subscription, there is plenty available for free. We were sent a lovely bundle of writing materials by Stabilo, and having fun with these resources was a great way to try them out. Harry was keen to start with a Titanic wordsearch (Twinkl subscriber resource). He chose to use these gorgeous EASYcolors colouring pencils. They have notches down the length of the pencil to make it easy to position the fingers correctly and they wrote smoothly in lovely bright colours. I gave Mia a set of crayons called the WOODY Wallet - six chunky pencils which colour like crayons and can also be used wet. Again, the colours were bold and bright and they were easy for her to hold. Her Ice Berg picture is one of the Titanic Colouring Posters (free download). She picks up so much of what is going around her, and she can easily recognise the Titanic now when she sees a picture of it! I also wanted to stretch Harry a bit, so I printed out a Titanic Acrostic Poem (Twinkl subscriber resource), which Harry used in conjunction with a Titanic Word Mat (Twinkl subscriber resource). I love the Twinkl word mats, they are available for almost every topic you can think of and are a great way to increase vocabulary. He had to come up with a word to describe the Titanic for each letter, and although I did give him quite a bit of help with thinking up the words I think that he did really well. For his writing he tried out the Stabilo EASYergo 1.4. It's a mechanical pencil so you don't need to sharpen it, and it also comes with a couple of replacement leads which are stored inside it. Harry had never seen anything like this and he was fascinated - this pencil definitely appealed more to him than a normal one! I was also very impressed by how comfortable it was to use. I must admit at this point that I have a terrible pencil grip, it was never picked up on at any point, and because I think that my writing is quite neat I'm reluctant to try and learn how to hold a pencil properly. But this mechanical pencil did give me an idea as to how I should really be holding a pen. I've mentioned a few of the Twinkl Titanic resources that we used above, and below are the others that I found useful at Harry's level (Early Years/Reception). 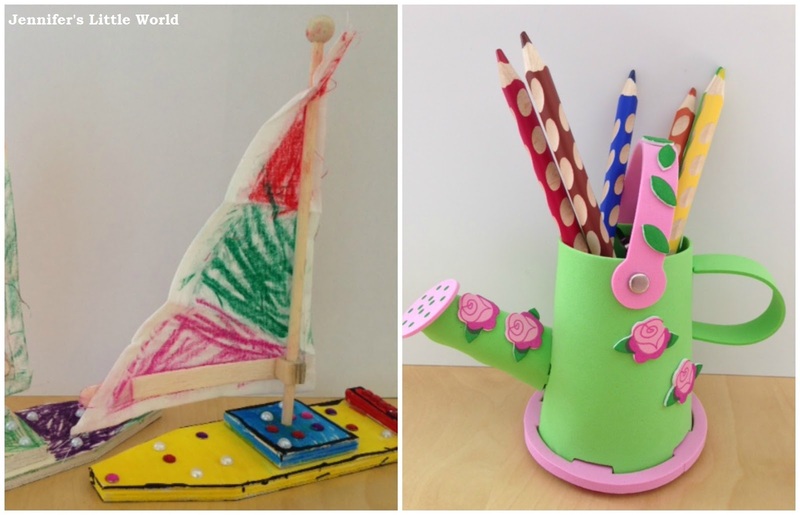 Twinkl also have all sorts of Titanic materials aimed at older children, including plenty of role play and literacy activities. 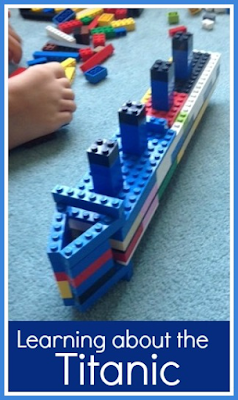 Even very young children would enjoy using the Titanic Playdough Mats (Twinkl subscriber resource) and could practice cutting and ordering skills with the Titanic Size Ordering (Twinkl subscriber resrouce) sheet. Harry is a fairly confident reader, and he enjoyed the Titanic Word and Picture Matching Worksheet (Twinkl subscriber resource). You could help younger children by reading the words for them and helping them match the word to the picture. Finally Harry very much enjoyed looking at and colouring this Titanic Cross Section Template (free download), which is best used in conjunction with the Titanic Cross Section Poster (Twinkl subscriber resource). We received these Stabilo products in exchange for a review. I have also kindly been given a Premium subscription to Twinkl in exchange for past review posts, but the resources are so great that I regularly write about them of my own accord! I might appear quite crafty, but the thought of having to come up with a themed costume for a school event always fills me with dread. There's a huge difference between buying a costume on eBay and spending hours coming up with a lovingly handcrafted effort, and I'm not sure where on the scale I fit in. I cheated a bit for Harry's 'Fairytale Day' by dressing him as a Prince - making him a crown and sending him in wearing his formal suit. I also played it safe for 'World Book Day', going with a Charlie Bucket costume that involved jeans and a plain top. I did go to a little more effort with the Shepherd's Nativity costume, but generally I've kept it simple. I decided to make Harry more of a Lion Trainer, so instead of a whip we made him a little tin for 'Lion Treats', which he filled with coloured sweets that he drew and cut out. I took our hula hoop and added flames by cutting shapes out of red and yellow paper and taping them around the top edge. Then he wore his smart trousers and waistcoat with a t-shirt. I would have liked to add a moustache but he refuses any kind of face paint. A lion was an essential part of the costume, and fortunately we have a stuffed Simba. Even though it was the morning of the Britmums conference and I was almost off duty, I went along to the school to see all the other children dress up (and pick up some ideas for when it's Mia's turn in a couple of years). One really original costume that I saw was a plate spinner, with a paper plate taped to a stick. There were also a few strongmen and plenty of clowns. Most of the girls were in tutus, so that's something that I should be able to manage! What Harry really liked about this costume was the opportunities that it gave him for role play. Although I don't think that they put on any kind of performance at the school, he had a great time at home playing lion tamers, teaching his toy lion to jump through the hoop and do other tricks before being rewarded with a sweet. What sort of costumes have you had to produce for your child? 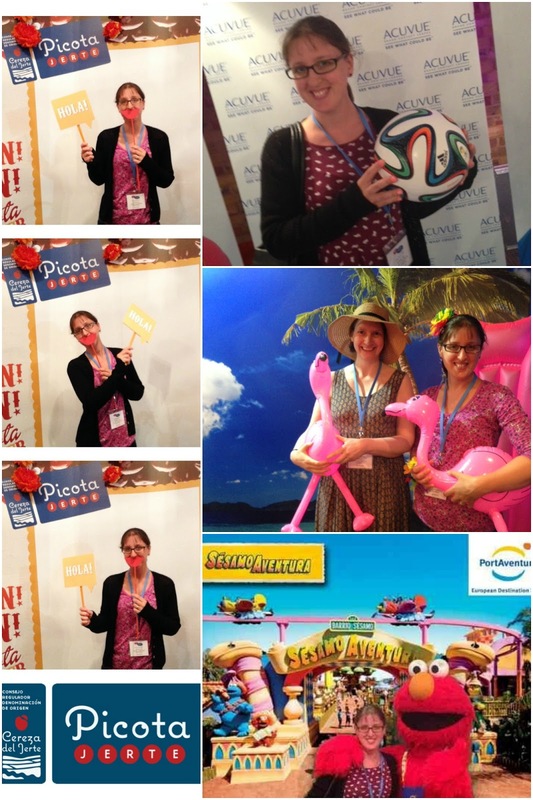 This weekend I spent a fantastic couple of days at Britmums Live 2014. I booked my ticket just hours after returning from from Britmums Live 2013, and I think that it's safe to say that I won't be waiting long to book a ticket for Britmums Live 2015. I was a little braver this year, and didn't line up a buddy to accompany me into the conference. Nonetheless I was rather relieved when I went into the Premier Inn to check my room arrangements to recognise fellow cross stitcher Ruthy from Minibreak Mummy sitting in reception. I persuaded her to accompany me to All Bar One where I knew that some bloggers were meeting beforehand, and I was very glad that I had found her, because when we arrived I couldn't immediately see anyone that I recognised! Once inside, it wasn't long before I discovered the Lindeman's stand giving out free wine, and my blogging buddy Swazi from Chocolate is not the Only Fruit knew exactly where to find me. It was also lovely to catch up over the conference with Kath from Dreaming of a Craft Room, and she introduced me to the equally lovely Ella from Purple Ella. As well as meeting new people and seeing familiar faces, a main focus of the event for me was the sessions, and once again I've come away with a notebook bulging with ideas and inspiration. 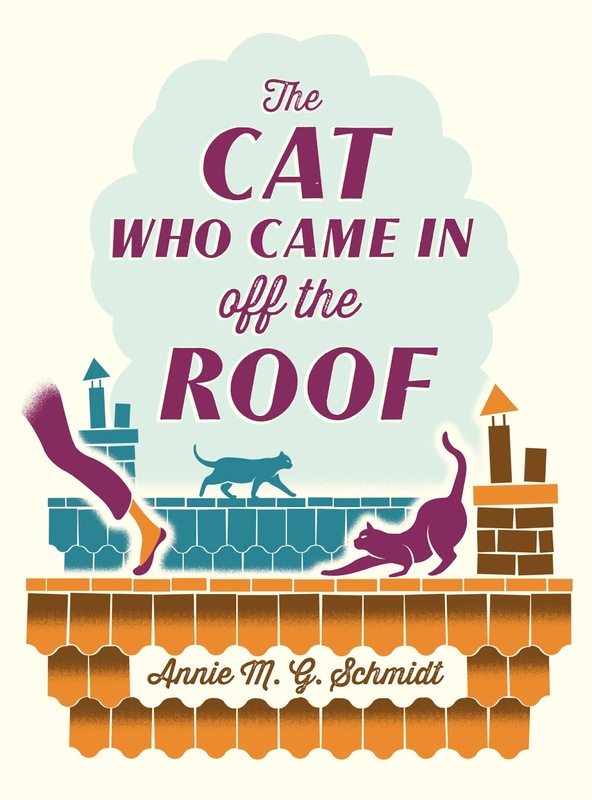 My first session was Writer's block and unlocking the creative process with published authors, and I was excited to see that one of the panellists was Amanda Jennings, having just received The Judas Scar to review for the Britmums book club. 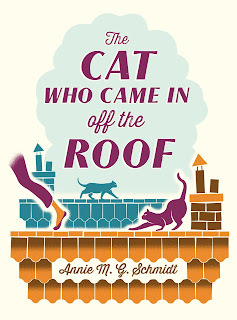 I've talked before about how I don't feel that I have a book in me, and that hasn't changed, but I was really inspired by how these three women (also speaking were Hannah Beckerman and Rowan Coleman) had managed to write not just one but multiple books, with less free time than I think that I have. They all had different ways of working, but what really stuck out was the fact that they had each found the time to write, whether it was capturing odd moments throughout the day or setting aside dedicated blocks of time. It really made me think about how I could use my spare time more constructively. I also really loved my second session - Design tips to make your blog look gorgeous with Lucy Heath from Capture by Lucy. I'm well aware that my blog is in need of a makeover, and now that I'm more confident with customising Blogger I'm going to go right back to the beginning with a blog mood board and do my best to come up with a new, more professional design. The second day of the conference can be quite intensive, as there are lots of sessions. After the very moving keynote speech from Benjamin Brooks-Dutton from Life as a Widower, I took a break and made some time to visit some of the sponsors of the event. Then I attended the Pinterest session, which was presented by Lizzie Sibley, UK Community Marketing Manager for Pinterest. I love using Pinterest for myself (insert gratuitous link to my Pinterest profile) but I'm pretty useless at using it to promote my blog, so I picked up lots of tips. In particular I was very interested to learn that 75% of Pinterest usage is via a mobile device, so it's really important to make sure that your blog looks good on a mobile. The Collaboration session was also very helpful. I've never really thought about asking other bloggers to join me in anything, despite having seen it work very successfully for others. It's a really good idea to locate and contact other bloggers in your niche that have been blogging for a similar time or are at a similar place in terms of traffic and followers, and work with them so that you can build on each other's strengths. I also attended the Travel Blogging session. I was worried that it might be too similar to last year's session, but I did want to see Simon Calder and I picked up lots of useful tips, in particular, to include the children's point of view as I write about places that we visit. The trouble is that I'm torn between being a 'Travel Blogger' writing interesting posts written from an alternative angle, and just keeping it simple with a straight diary style, after all this blog is really about keeping a record of my memories. After lunch came a session which I only decided to attend at the last minute thanks to Louse from A Strong Coffee, and I'm so glad that I did. YouTube with Greg Brand from Travizeo was packed with so much useful information. I've been using YouTube for a little while (insert gratuitous link to my YouTube channel) but I've slacked off a bit lately, even though some of my videos actually do quite well. I've learned a few things that I can add to my videos, like how to add associated website annotations, and it's given me the push to get up and running with the video again. My final session was Tech Knowledge with Ruth Arnold from GeekMummy. I found that I was already doing many of the things mentioned, but it was really valuable to have some reminders about things like regular blog backups. I also learned a bit more about Google Analytics. Although I have it installed I don't find it particularly easy to use, so I'm going to make the effort to try and get to know it a little better. I did spend a short while wandering about on my own which made me feel a bit lost for a time. I don't know why it didn't occur to me that I could actually leave the venue for a bit and take some time for a quick walk outside by myself! I made more of an effort to talk to the sponsors this year, although I don't find it easy. I introduced myself to the representatives from Butlins, having applied for their ambassador programme this year, and I also met the ladies from Parragon books. I've been a book buddy for a year now, and I'm looking forward to helping Harry take part in their "Summer with Gold Stars" challenge to continue his learning throughout the summer holiday. I love talking about family travel and I had a great chat with Carnival (who were giving away some fantastic sand toy sets), although I did feel a bit disrespectful talking about our cruises with other companies! Rangemaster were also handing out some lovely baked treats and there was plenty of delicious food in the Morrison's lounge. BritMums 2014 ended with the keynote speeches - twelve bloggers reading out their own, always very moving, blog posts. Then we were treated to a short musical performance by The Good Enough Mums Club which I really enjoyed and it was a great way to end the conference, with catchy songs and plenty of humour. I was feeling pretty emotional at the end, a feeling I remember very well from last year. It's a combination of having been completely overwhelmed, tiredness, emotions brought on by the bloggers' keynote readings, and of course having missed the little ones and being ready for home. But I'm very much hoping to return for Britmums Live 2015! On our recent holiday to Ibiza we made the decision not to purchase wi-fi at the hotel. Instead we mostly left our phones in the safe in the hotel room and managed without. I'm really glad that we made that decision, because it made me think a lot about how much I use my smart phone. The trouble is that I feel I need to be contactable - by my husband, by the school or nursery. I also use my phone for lots of things - as a camera, a clock, shopping list, calorie counter, housework organiser. So I tend to carry it about the house with me. With instant notification of a new e-mail or social media mention, I feel obliged to check it straight away. If I'm occupied and can't respond immediately, I start to feel anxious. If I'm halfway through responding and I'm interrupted, I become irritable. But on holiday it was different. A couple of times during the week I checked my e-mails, but because I wasn't watching them as they came in I didn't feel that I had to respond immediately. In the end, there were only a very few e-mails that actually needed a response. I took a small notebook away with me, and I found myself jotting things down - ideas for blog posts (like this one!) and also random thoughts. I do like writing, and so the notebook became my blog substitute. With all that time to think instead of mindlessly scrolling on a phone screen, I found myself reminiscing happily to myself about previous holidays that I've enjoyed, and then talking about those memories with the children. I also managed to read three books, mainly using those short periods of spare time when I would have been on my phone. Since coming home, it's really made me think, and I've been trying very hard to leave the phone on the side, where I can still hear it ringing but can ignore the other noises that it makes. Because of course the real impact of being constantly on the phone is on the rest of the family. The children are growing up in a world where they are surrounded by smartphones, tablets and all the technology that is yet to come. They do need to use and be familiar with it, and their childhoods are going to be very different to mine. I also gain a lot from using my phone - there is always someone to chat to on-line and I've found plenty of thought provoking and informative content to read. But children learn by example, and I can see a scenario in a few years time where we are all sat around physically in the same room but interacting with a screen instead of each other. In fact I can already see it happening sometimes now. So I'm now going to try very hard from now on to set a good example. I'll leave you with this video, you've probably already seen it but it definitely deserves repeated viewing! We make so many Hama bead creations in this house that I'm always looking for ways that we can show off the results. 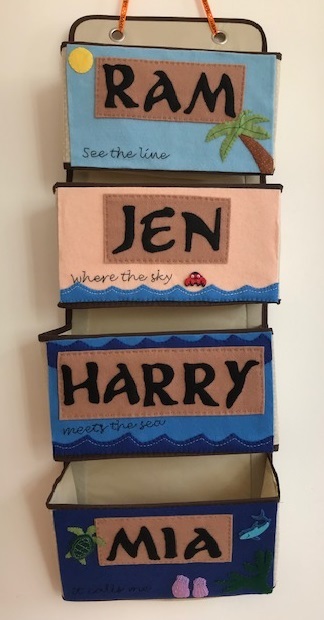 I have written a whole post on ways to display finished Hama bead projects, and this Hama bead hair clip holder is another great way to put some of those mini pieces of art to a practical use. Mia was born with plenty of hair, and she's needed hair clips to hold it out of her face since she was quite little. We have lots and lots, and now that she's a bit older they stay around for longer before she loses them. I wanted a way to store them to keep them on display, and also to have a way of keeping pairs together. Hair clip holders using ribbons are all over Pinterest, and I thought that a Hama bead design would be perfect for my Hama bead obsessed daughter, as well as being a nice weight for the hair clip holder - light enough to hang easily on the wall yet heavy enough to keep the end of the ribbon weighted down. It was a super simple project to put together, and I didn't even need to do any actual Hama beading. I just raided our shoebox of finished pieces for a couple of pretty ones! I have a huge stash of ribbon and I don't think that I've ever purchased any, this ribbon was around some pyjamas that I received for Christmas. I cut a fairly long length of the ribbon and attached it to the Hama beads by sewing it firmly in place. Hama beads are easy to sew to because of the holes, and you just need a few stitches to secure it in place. The flower has stitches at the top and the bottom to keep it straight, the rainbow at the bottom just has one set of stitches. I folded the top of the ribbon over and sewed securely down each side. This forms a pocket which will hang over the hook when it's on the wall. I have hung it up on the wall next to Mia's bed (that's her felt name picture also by her bed, an old project now but still on display!). She's pretty fascinated with it at the moment and keeps reorganising her clips, I'm hoping that the novelty will wear off after a while! If you like this Hama bead project you might also like my Hama bead hanging hearts decoration. I also have an entire page of Hama bead crafts! On our recent holiday to Ibiza we stayed for a week at the Fiesta Hotel Cala Nova in Es Canar. I thought I'd blog a quick review of the hotel in case anyone is looking to book a holiday there! The Fiesta Hotel Cala Nova hotel is situated on Cala Nova beach in Ibiza, and within a short walking distance of Es Canar beach. The town of Es Canar is quite small, but has plenty of small shops and bars and a good sized beach. You can also easily take a bus from Es Canar bus station to Santa Eulalia, about fifteen minutes drive away. Santa Eulalia is a lovely town in itself - lots going on and a large, clean beach - and from here you can transfer to buses which will take you all over the island. Overall the Fiesta Hotel Cala Nova was a good hotel, and certainly suitable for us as a family. The location was excellent, Cala Nova beach is literally right there and Es Canar beach with supermarket, small shops and places to eat and drink a very short and pleasant walk away. It wasn't too crowded when we visited, even though it was May half-term. We always found somewhere to sit by the pool, and there was plenty of space to play on the beaches. We were half-board, so breakfast and dinner were included. Food is served via a buffet, which was spacious and well arranged so there was never really a queue. However we are vegetarians and we did find that the dinner selection wasn't that great. Although there were vegetables cooked to accompany the main meals and there were always several cold salads, there wasn't always a specifically vegetarian main dish. There were always chips, and plenty of fruit and bread, but a bit more choice would have been nice. We had rooms on the first floor at the front of the hotel. We booked two inter-connecting rooms, and we felt quite happy to have the children sleeping in one room while we slept in the other, keeping the door wide open at night. Each room had a balcony too, and so we had plenty of space. We did find that our room was quite noisy. There was a steady stream of buses outside our window dropping off and collecting guests, as well as daily early morning rubbish collection and deliveries day and night. A room at the back of the hotel might have been a bit quieter. We didn't pay for wi-fi in the hotel, but we found that all the bars and cafes along the beachfront in Es Canar offered an hour's free wi-fi if you bought something there, so we made use of this a couple of times. The hotel has a small children's pool with a few little slides. It's very shallow and children can play there quite happily. There is a larger pool too which we didn't use but it seemed to have plenty of room for swimming and there were quite often activities taking place there, like a huge inflatable slide or other organised games. By the pool there are also a few mini golf holes (you can borrow clubs and balls for a small deposit), a couple of swings and some see-saws. It's not a huge playground, but nice to have it right there in the pool area and in easy view of the sun loungers. There is also a games room with various arcade machines, air hockey and pool (all for an extra charge). There wasn't a dedicated children's club as such, but there was a children's entertainer by the pool every afternoon and she was doing a brilliant job. There were a few organised activities for a couple of hours, and then every evening at 8.30pm was the Mini Disco which our children absolutely loved. It was pretty much the same every night, a selection of action songs in various languages with the entertainer on stage leading the dancing and all the children joining in. A couple of times Goofy even made an appearance! We generally took the children to bed after the disco, which was followed by Bingo and then a show or music act. The only evening entertainment that we stayed up for was a bird show with trained parrots, perhaps not the most professional show to a grown up's eye but the children loved it! We had a really lovely holiday, which you can read more about here - Our family holiday in Ibiza. This week my crafting has been inspired by a lovely book which I've been sent to review. Petit Collage by Lorena Siminovich (affiliate link) is packed with easy craft projects to brighten up your home. 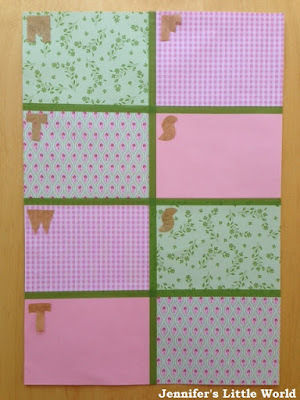 My first project from the book was this dry erase week to view calendar. 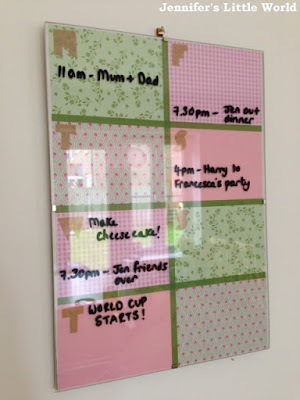 We use Google calendar on-line to keep our family diary in sync, which works very well, but I find that I also like to have a visual plan of the upcoming week to help keep me organised. I used a cheap glass clip frame (two for £2 in Asda) and some pretty patterned paper (Spring Patterned Card and Paper Pack from Baker Ross, which I also used for my Ikea wooden drawers). The project is adapted from the Dry-Erase Dinner Planner in the book. 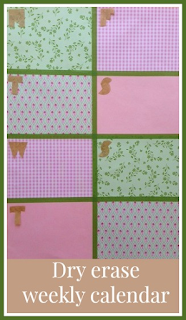 I made the calendar A4 size. I began by choosing and cutting out my rectangles of paper. In the original project the days are arranged underneath each other, but I wanted a bit more space to write so I divided the calendar up into eighths, leaving a final rectangle for extra notes. I tried to choose paper with a small pattern so that it wouldn't detract from the writing over it. Although I tried my best, for some reason I'm just not very good at measuring! 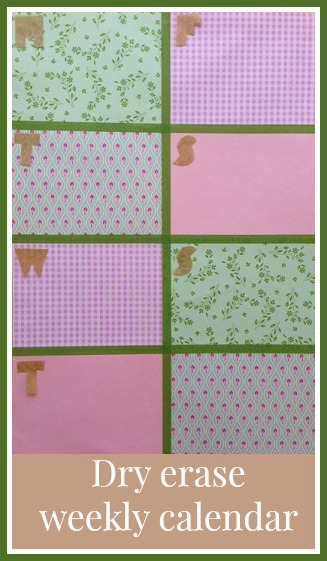 Fortunately that didn't matter, as I was able to use some thin washi tape to mark out the boundaries between sections. 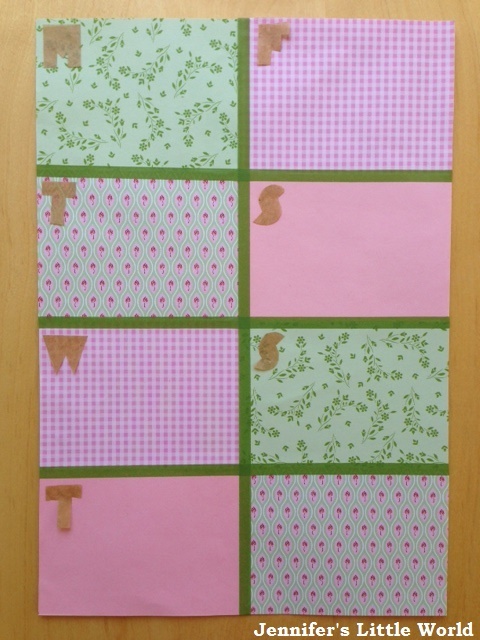 I finished it off with the initial letters for the days of the week, using the template included with the book. Then I clipped it into the frame and mounted it on the wall. Luckily I had a dry-erase marker to hand. For now the pen is stuck to the wall beside the calendar, but I may look at purchasing a magnet to affix and stop it getting lost. 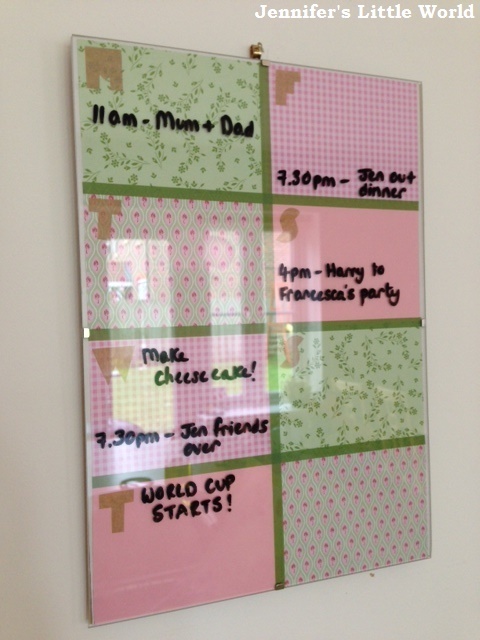 Here is the finished calendar in situ in the kitchen, as you can see we have an exciting week, and it's proving very handy! For Mia's birthday I baked a dessert that I've been meaning to try for a long time - chocolate brownie cheesecake! The recipe comes from my brother who has impressed me with it in the past. It does take quite a few ingredients, but I found it pretty easy to make (and I had never made a cheesecake before). The cheesecake works best if you make it the day before and refrigerate overnight, so it's great if you are making it for an occasion where you want to prep as much as you can in advance. The brownie base can also be used to make standalone brownies, in fact I used this brownie recipe for my delicious cookie and brownie petit fours. Start by making the brownie base. Melt the chocolate in a bowl. In a separate bowl, cream the butter and sugar together then beat in the eggs. Mix in the flour and the melted chocolate until you have a smooth mixture, then pour into a circular baking tray (mine measures 26cm in diameter which is about the minimum size I'd recommend using, but you could easily use one a few centimetres larger). As I had the oven on anyway, I placed the brownie base into the oven (180C) for about five minutes just to make it a little firmer before putting on the topping. Then make the cheesecake topping. Cream together the cream cheese and icing sugar then mix in the eggs. Spoon the mixture on top of the brownie base, making sure that it is spread evenly across. Smooth over with a knife. Bake in a pre-heated oven at 180C until the top has browned slightly and it is golden around the edges. I found that it took about 45 minutes. Leave to cool completely, then refrigerate overnight. I was recently asked if I would like to try out some Thermomorph in my crafting. I hadn't heard of Thermomorph before, but I love trying out new ways to craft and a quick look on-line suggested that it looked like a really fun and versatile crafting material. Thermomorph is made from polymorph granules - small pellets of plastic which melt together when added to boiling water to form a mouldable substance. You have a few minutes to mould the plastic before it sets and becomes too stiff to handle. You can make your own shapes, push it into moulds, or shape it by pressing against other textured surfaces. Although I was asked to review it as a crafter, I can see that it would have many other uses around the home, particularly for DIY projects if you are trying to fix or replace small plastic parts. I had a few ideas for ways that I could use the ThermoMorph in my crafting, and once I got started I kept thinking of more crafts! I'll start with a quick introduction to ThermoMorph. It's really easy to get the ThermoMorph ready to use. I used a little pyrex jug and poured a small amount of boiling water into the bottom. Then I spooned in a few teaspoons of granules at a time. The granules start to melt almost immediately, and you know that they are ready after a minute or two when they have become transparent and clump together. Then you can remove them with a spoon and squash it all together, and although hot the ThermoMorph is ready to handle almost immediately. It cools very quickly to a temperature that I was happy to even allow the children to touch (obviously I kept them well away from the hot water). You can tear it easily into smaller clumps. You have a couple of minutes to manipulate it before it starts to become cloudy and solidify too much to use. It has set pretty much solid after about ten minutes. I found that the water only stayed hot enough for me to melt one batch at a time, so ideally you need to work somewhere with access to a kettle and sink so that you can replenish the hot water. If you run out of time and the plastic has become too solid you can re-melt it by popping it back in hot water (but you will lose any shape that you've already moulded). The most obvious place for me to start was making shapes using moulds. I found that the best types of mould were silicon moulds, but I did manage to use plastic chocolate moulds too. For the plastic moulds it's important to wait until the ThermoMorph has cooled quite a bit, press it into the mould and remove it straight away. Hot plastic into a plastic mould does not end well. I made some pretty seashells using a plastic Wilton chocolate mould (which I bought in the US but similar ones are available in this country). 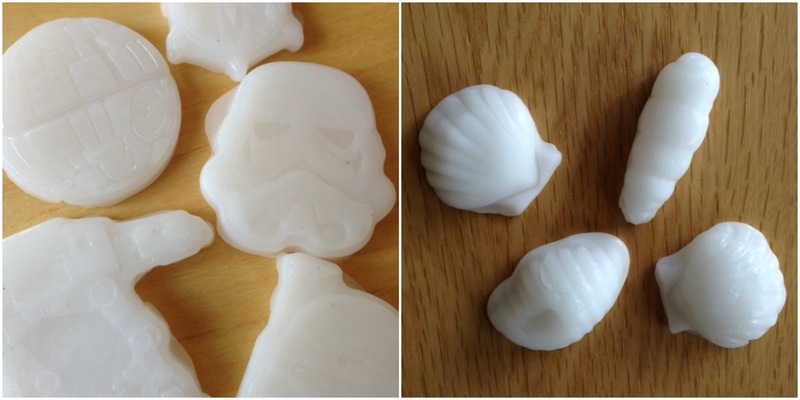 The Star Wars shapes are made using silicon chocolate moulds which I borrowed from a friend. The plastic shapes would make good game pieces or counters, and I can imagine making something like a themed chess or draughts set. They would also be lovely keyrings or magnets, as little gifts or keepsakes. They could easily be painted too. I'm intending to paint these like the moulded snowflakes which you can see below. After using the ThermoMorph for a while I was confident enough to let the children get involved. It's only really hot when you first remove it from the water, and it very quickly cools to a temperature that is very safe to touch. I made some round balls and then let the children press their fingers into them to create an imprint. When the plastic had fully set I used a cotton bud to rub some black stamping ink and then some silver stamping ink over the fingerprint detail. It picked up the fingerprint really clearly. Then I painted the back and around the edges using silver acrylic paint. It needed a few coats to produce a nice finish and I was really pleased with how well the silver paint worked (I just used Hobbycraft own brand acrylic paint). The stamping ink produced a nice effect on the ThermoMorph too. Finally I glued a small magnet to the back of each. 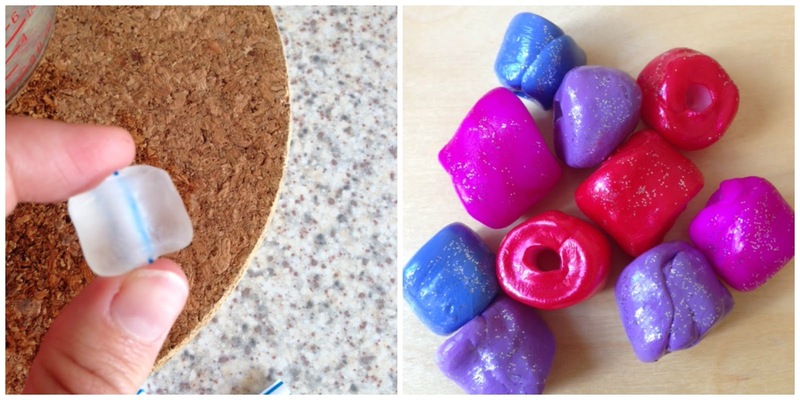 When making the original mould you could also make a hole in the plastic so that you could use it as a pendant or a keyring (see the ThermoMorph beads below for how to make a hole in the ThermoMorph as it's setting). I also wrote the child's name and the date on the back in permanent marker - as it turned out that both fingerprints were almost the same size! Originally I wanted to try and carve the ThermoMorph itself into a stamp, but I don't have any experience with carving and my lino cutters didn't work, so instead I used the stamp handle that I had made as a holder for a stamp outline. I moulded a lump with a handle in the top, shaped exactly to match my fingers, then pressed it against a flat silicon sheet (I used the base of a square silicon cake tin) while it set to create a nice flat base. 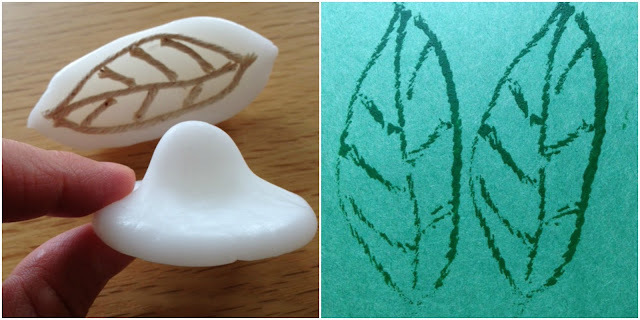 Then when it was set I glued string to the stamp to make a leaf shape. It was easily washed off once I'd finished so that I can make new designs. I've tried and failed to make salt dough beads, so I thought I'd have more success with the ThermoMorph. I cut a drinking straw into small segments about 15mm long, then wrapped the melted ThermoMorph around it, making sure to keep the ends of the straw clear. The children helped with these too, rolling and shaping them to create some very unique beads. Originally I was going to keep the straw inside the bead, but when the ThermoMorph was nearly set I found that I was able to easily remove the pieces of straw using a pair of tweezers. This time I tried painting the ThermoMorph with nail varnish, and it was very successful. The beads still needed two coats, but because the nail varnish dries so quickly it didn't take long to do, and I'm lucky enough to have quite an extensive brightly coloured nail varnish collection. Then I finished them off with a generous coat of silver glitter paint. Although I made these beads quickly with the children for them to play with, I can see that with a bit more time and thought you could come up with some beads that would be stylish enough to wear as actual grown-up jewellery. You could make some lovely chunky pendants or earrings. The children made these pretty snowflakes using a silicon chocolate snowflake mould. I made the ThermoMorph into small balls and placed them in the centre of the mould, then the children pressed them down to fit the shape. The mould is quite deep, so they didn't fill it to the top, they just covered the very bottom which is enough to imprint the pattern. The next day we painted the snowflakes. Like the fingerprint keepsakes, we used a couple of coats of silver acrylic paint, then finished off with some silver glitter paint. They will make lovely Christmas decorations or would also work well as embellishments for Christmas cards as they are fairly thin. They could be used as Christmas tree decorations, either by making a hole before the plastic has set or just by gluing ribbon to the back. And as well as all this crafting, I also used ThermoMoprh to build a replacement part for our broken laundry basket! I really enjoyed playing with the ThermoMorph. And it's great for experimenting with, because if you make a mistake or you aren't happy with your creation, you can just pop it back into the boiling water and start again! A little goes a really long way, even though some of our creations seem quite large I still have plenty left. A 500g tub currently costs £19.49 on Amazon, not a bad price at all considering how far it will go. I was sent a tub of ThermoMorph in exchange for this review.